Yes,Yes ,Yes My very first catch! Ever. I have never fished before! Were the words of sheer thrill from Delores Raycraft and her family from Hamilton Ontario. Coincidently, her Son-in-Law is a district fire chief in Hamilton Ontario. 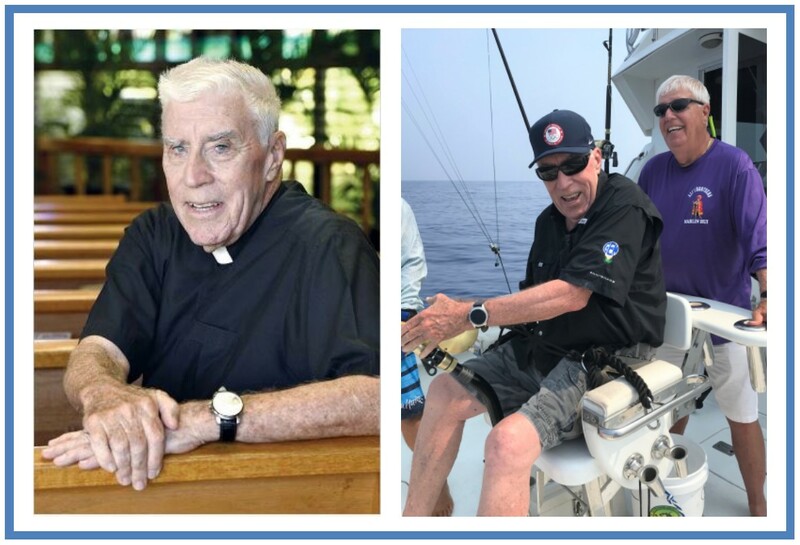 (A profession near and dear to my heart.) Delores sat in the fighting chair and waited patiently for what seemed like several hours. At one point she pronounced to everyone, “if this rod gets bit, I’m bringing it in!” You probably see the rest of the story unfolding…. the rod did go off, Delores fought the fish and I landed it! 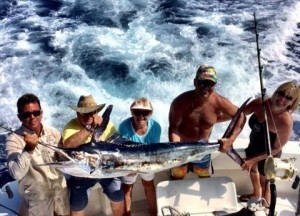 A nice 70+ pound Striped Marlin! I know her Son-in-Law will be back to book another trip because after all, he had to go back to the fire station to tell them his mother-in-law was the only one to bring in the big fish. I must add that Delores and her husband and were celebrating their 50th wedding anniversary as well. We are looking forward to a return trip from to Hawaii and of course the Fire Hatt. https://www.firehattsportfishing.com/wp-content/uploads/2016/02/Canada-Group-for-Blog-1.jpg 345 480 linda https://www.firehattsportfishing.com/wp-content/uploads/2014/01/Fire-Hatt-Sport-Fishing-Kona-Logo2-300x53.jpg linda2016-02-13 18:33:572016-02-13 18:34:51Yes,Yes ,Yes My very first catch! Spearfish Are Here and They Are Hungry. With fishing or should I say “catching” having been slow for a few weeks, the bite finally turned on. 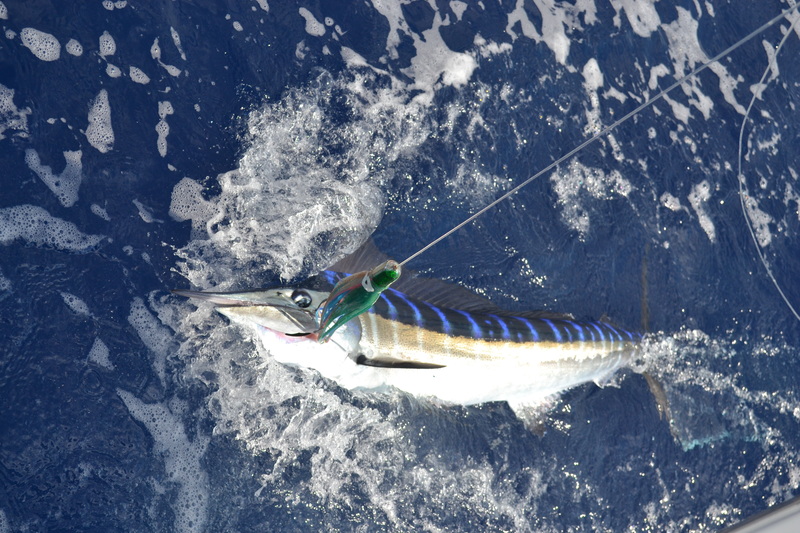 There have been reports of Striped Marlin and Spearfish in numbers showing up daily. We have had nice bites on Mahi Mahi too. Recently, on a half day afternoon family fishing trip, Ken Shaw from Edmonton Alberta landed this impressive 35+ lb Shortbill Spearfish. The past few days we have had multiple hookups. We’ve had a good couple of days landing two nice Spearfish and a Mahi Mahi and an Ono. Featured in the photo representing AFTCO as one of their Pro Teams is First Mate Brett Lasenby with angler Ken Shaw. 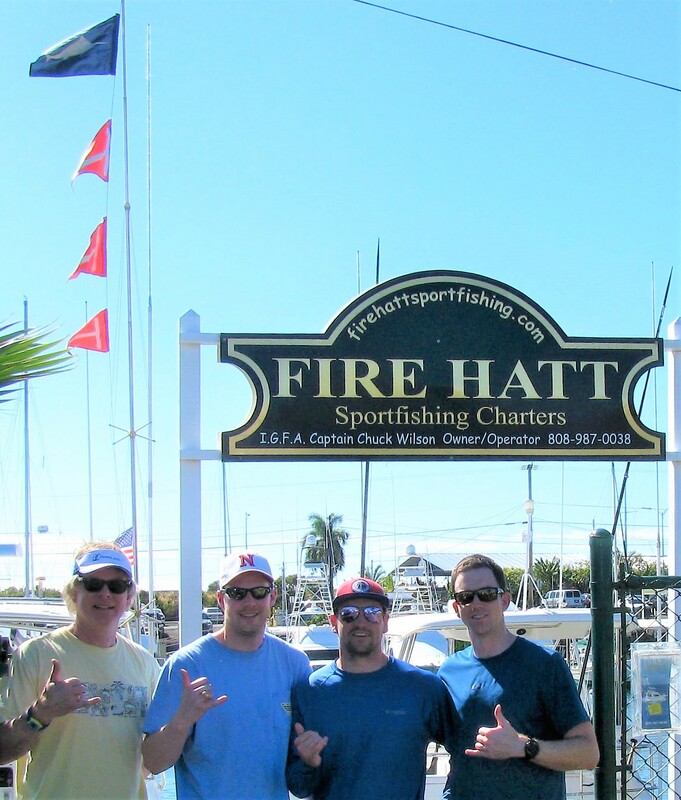 https://www.firehattsportfishing.com/wp-content/uploads/2014/02/DSCN4694.jpg 2127 1938 linda https://www.firehattsportfishing.com/wp-content/uploads/2014/01/Fire-Hatt-Sport-Fishing-Kona-Logo2-300x53.jpg linda2014-01-06 13:45:232014-02-03 12:42:33Spearfish Are Here and They Are Hungry. Banner Day Aboard Fire Hatt. It just doesn’t get better than this! 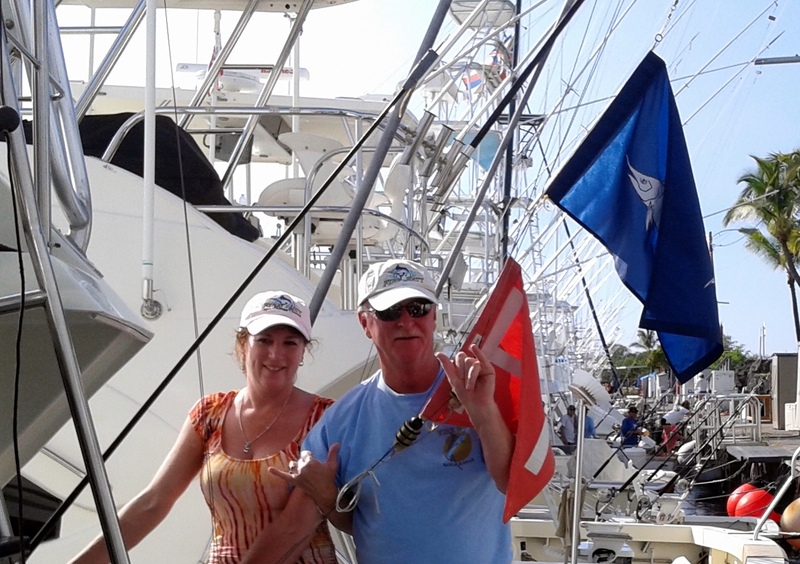 Heather and Rob Dawson from Kamloops, Canada spend a few weeks a year here fishing in Kona. 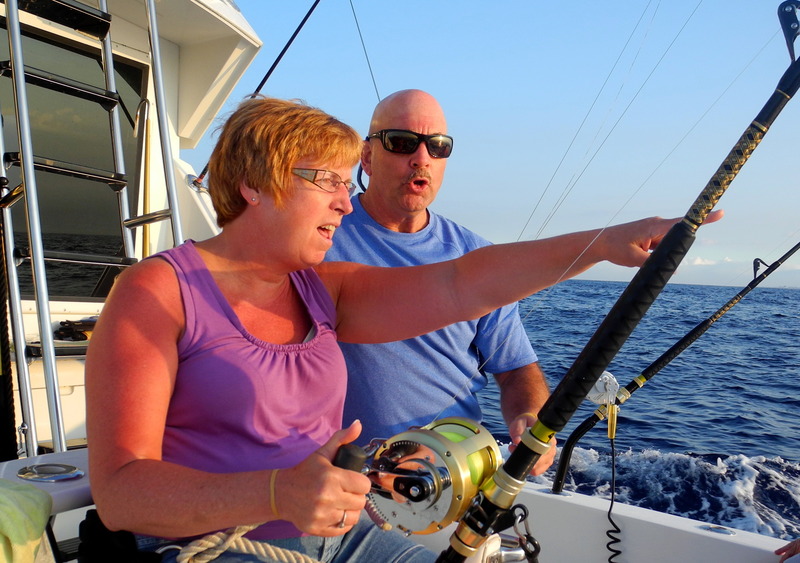 The Dawson’s own a boat and are avid fishermen at home. This year the two of them put in three full days of fishing. The first day did not even produce one bite! It has been a frustratiing couple of months for fishing here in Kona. the bite has definately been off. A few fish being caught each day is all that has been reported. Every year that the Dawson’s arrive, Rob announces that he wants to go Shark Hunting. A few years back we landed Rob a 300+ pound White Tip Shark that we tagged and released. Last year we did not produce one for him. So this year he wants to try again. 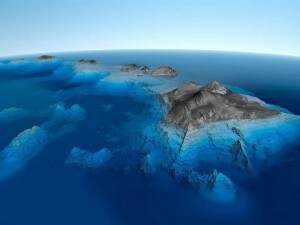 So on this day we head way south to “UU Buoy” to give it a try. We head out and will troll to the area and hope to at least catch them a food fish on the way. 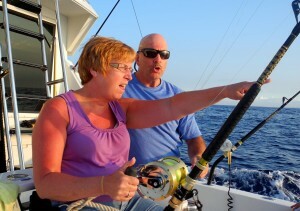 Then just10 minutes out of the harbor we are Hooked Up! Four lines are screaming! A quadruple Stiped Marlin Bite! Heather is in the chair and Rob is deciding what line HE wants. Rob gets his fish to the boat first and it is successfully tagged and released. The fish is estimated at about 50 pounds. Heather brings her fish to the boat after about a 10 minute fight. Hers is also successfully tagged and released. Her fish is the bigger of the two estimated at about 80 pounds. 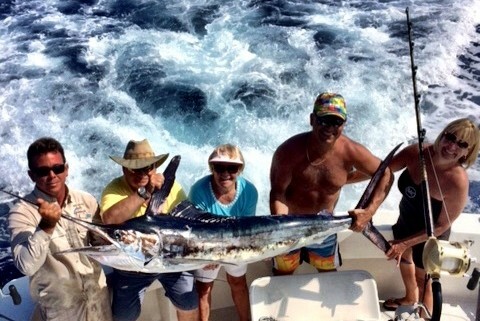 This is Heather’s first billfish ever. Nice Work by these two anglers. With lines back in the water we are under way for the anticipated shark encounter. We are hooked up again. Heather is in the chair and this time she lands her first Shortbill Spearfish. Now we arrive at the buoy and there are a few boats fishing the area so we know there are bait fish around. We stop outside of them and begin to put chum in the water and within a few short minutes we have our first shark sighting. Looks like a White Tip Shark. We bait a single hook and offer it. One bump, two bumps, a short run and the bait is gone. We try again and after about an hour, we have another visitor. All we see is a big dark shape in the water and it is interested in the bait. Again, the fish bumps the bait a few times, takes it for a short run and we set the hook. Rob is in the chair with a huge grin on his face. He got his Shark. 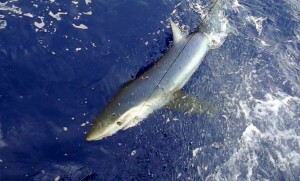 When we got it to the side of the boat, we were surprised to see that it was a “Blue Shark”. They are known to be in the area, but not seen that often. Rob wanted to be the one to release it, so with assistance from Adam our crewman, he held the leader and let Rob cut him loose. We photographed the fish and successfully released it back into the deep! The score at the end of the day…Three Striped Marlin Releases, one Boated Shortbill Spearfish and one Released Blue Shark. A Banner Day! 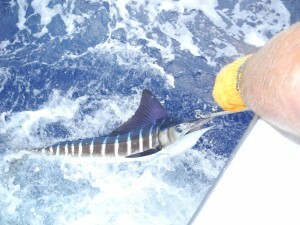 Fishing in KONA HAWAII – The Anglers Paradise, I wonder which October will show up in 2012? We have not had our usual warm water yet in 2012 and just like the last two years, October may bring us the warmest water of the year, or not. Funny about that Mother Nature thing, and the more you think you can predict future pattern, the more it seems you get fooled. Today in mid-September, we had 81 degree Ocean water temps, almost two degrees cooler than last year at this time. If our last two years pattern holds, we should see 83 degree water temps and an increase in big Blue Marlin hook-ups so come on over to Hawaii and get in on thelate season bite. Several big Blue Marlin were caught over the last two days with a couple over 600 and three over 400 so the big ones are still here. There are still Ono (Wahoo) around and even a 100 pound Striped Marlin was caught two days ago. It is a mixed bag and I sure hope the numbers of bites rise with some warm water. In October, we can expect, barring Mother Nature’s curve balls, to see great fishing since all this warmth and bait are here. There should also be lot’s of 50 plus into 200 pound Ahi here. 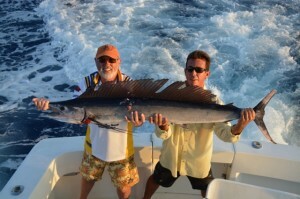 There have been some Ono (Wahoo) also taken on the ledges. 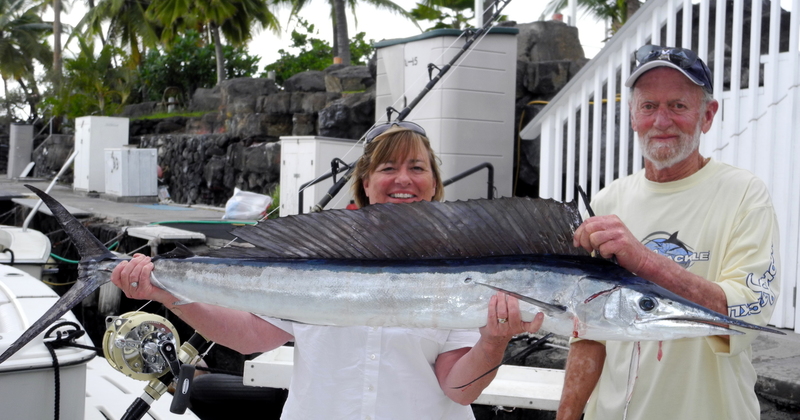 You just gotta love the year round big game fishing in KONA – The Anglers Paradise.